Latency Tester File: Here's an audio test file with a series of sharp signal transitions (Ex02.01:WAV/MP3 ) that make it easy to measure latency using the loop-back methods mentioned in Section 2.1.6 of the book. Section 2.3.2 Performance Parameters Demonstration: To clarify what I mean by some of the performance parameters listed in Section 2.3.2 of the book, take a listen to this rather uninspiring four-bar keyboard recording (Ex02.02:WAV/MP3 ). One problem is simply a question of balance: the repeated off-beat 'B' notes are consistently too loud compared with the more interesting upper and lower lines. This also affects the sense of pace, making the rhythm seem a bit stuck in the mud. In this example (Ex02.03:WAV/MP3 ), I've just adjusted the note balance to remedy these issues, in order to draw the listener's ear towards the more musically important aspects of the line. I've also attempted to make the second, third, and fourth quarter notes into a mini-phrase by emphasising the middle note of each group. However, there's no sense of phrasing across any of the bar lines, so in the final example (Ex02.04:WAV/MP3 ) I've experimented with articulating longer two-bar phrase 'arches' using note durations. 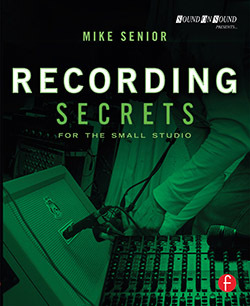 Backing-track Stems For Overdubbing Practice: If you don't have a project in progress suitable for the overdubbing Assignments in this (and later) chapters, then check out the 'Recording Secrets' Free Backing Stems Download Library for a range of projects in different styles, complete with accompanying session documentation. A-D/D-A Conversion Quality: Although I touch on dealing with recording mediums of different qualities on page 58 of the book, what I didn't discuss was the issue of digital conversion quality. My views on this issue are very similar to my opinion about microphone preamps expressed on page 146 -- only more so! In other words, I think that the differences between different analogue-to-digital converters are so small that even differences between microphone preamps are more significant, but that both are dwarfed by the differences between microphones and microphone placements. As such, I honestly find it difficult to recommend investing in expensive specialist A-D conversion boxes within almost any small-studio context on grounds of conversion quality. If you'd like to evaluate this assertion with your own ears, then check out 3D Audio's range of comparison CDs, which feature wide-ranging shootouts of microphones, preamps, and A-D converters. This Sound On Sound comparison of three high-end digital-to-analogue converters also makes interesting reading within this context. Free Loop Download Libraries: If you want something a little more inspiring to play along to than a click track while overdubbing, check out the royalty-free samples available from Freesound and Looperman. If they're not at the right tempo, then the time-stretching options within Cockos Reaper provide a very affordable (and high quality) remedy. XLR-to-TRS Barrel Adaptors For Headphone Extension: As discussed in Section 2.1.1 of the book, you can make a robust headphone-extension cable by combining a TRS-to-XLR(male) cable with an XLR(female)-to-TRS barrel adaptor such as the Neumann NA3FJ. The cable can also be extended further by adding normal XLR mic cables in line. Affordable Multi-output Headphone Amplifiers: You can get hold of extremely cheap models from companies such as ART, Behringer, and Samson, but personally I think it's worth spending a bit more money on something a little more robust (such as the Aphex Headpod 4) which can deliver a bit more power to each output socket. Oblique Strategies: Check out this detailed fan site for Brian Eno & Peter Schmidt's classic Oblique Strategies card set, or just click here to try out an online version. ASIO4ALL Universal Software ASIO Driver: Michael Tippach's recently overhauled freeware ASIO4ALL driver lets you reduce monitoring latency dramatically in situations where you're forced to work with a PC's built-in audio hardware, rather than using a dedicated recording interface. Latency Test Utilities: Here are a couple of freeware utilities you can use to measure your PC system's audio latency: CEntrance Latency Test Utility and Oblique Audio RTL . Note, however, that they won't take into account delays induced by plug-ins within a DAW project. Working With Latency In Computer Systems: Here's an excellent Sound On Sound magazine round-up of different monitoring schemes for computer DAW users: Living With Latency. Glossaries Of Musical Terms: Wikipedia now has an extensive musical glossary here, but check out MusicTheory.co.uk's Glossary Of Italian Musical Terms if you want to hear audio examples of the Italian pronunciation.